FS Flying School or FSFS for short is a comprehensive utility for X-Plane 10. FSFS is not an ordinary small plugin which aims to enhance your experience, instead FSFS is a desktop application which will add a ‘virtual instructor’ by your side! FSFS comes packed with a team of talking instructors who will comment on your flight in real time, instruct you on how to improve and also debrief you after the flight! Your personal instructor doesn’t limit you to fly in a specific area, you can fly wherever you want in the virtual XP world! Although you are limited to which aircraft you can fly, this being said FSFS by default will support a range of aircraft (default XP and some payware) and also you can enable FSFS to support an aircraft of your choice. Optionally you can also purchase extension packs for FSFS, this includes a detailed instructor tailored for C172, C208 and there is also a voice command extension pack. All covered in this review. Like I have said FSFS is a desktop application and therefore at the moment it is Windows only, although I do remember a Kickstarter campaign to enable Mac application development however I don’t believe thats available yet. Normally here I would list a bunch of product features however as there are so many for FSFS I will list the main features and you can see the rest listed here. Instructors give warnings before mistakes are made and also have many entertaining phrases! Optional Voice command pack allows you to talk to the instructor! First impressions? Wow! I was shocked on how easy this programme is to use and and how real it sounds! Before I go into detail with that though I had’t to set the programme up first. To tell the truth I had a few minor issues getting started. FSFS does work ‘out of the box’ and it did for me originally although a few flights later it stopped functioning. I contacted FSFS Support and the problem was fixed in no time, it was simply a file permission setting on my computer, I had’t to run the programme as administrator and have FSFS installed in C: to stop any further issues of file permissions. Since then I have had no other issues and FSFS is absolutely fantastic! A standard flight goes as follows. I started on the ramp in the C172, engines off and the aircraft cold and dark. With FSFS running as well as XP 10 I started the engine. The instructor will then notice everything that you do and comment on anything which can be improved. For example the instructor will call ‘rotate’ and guide you through every manoeuvre you make, as well as ‘your pitching up too much, lower the nose’ and, ‘watch that bank angle is starting to get a bit too steep’, this all adds to the great realism of which this product brings. What I really like about FSFS is how it predicts what could go wrong and correct you before it happens, for example levelling the wings during landing to even watching your steering on the ground! All with a virtual instructor that talks to you, fantastic! The most helpful warning I believe you can get is ‘watch out, don’t stall’ as stalling can become a dangerous situation if its not planned. This actually happened on a flight in the C208 I did. I departed from KLAX and I was focused on tuning the NAV, mixed with the complexity of the airways I was not consistently watching my speed. Luckily I has my virtual instructor who pointed out the slow speed so I could quickly correct it before stalling at 1200ft near LAX! So, there is my first impression of using FSFS now lets move onto installation. If I am honest installation didn't go completely smooth for me, as I have discussed above the main issue originally was application permissions. But even that solved I still found the programme unstable at times. By ‘unstable’ I don't mean crashing during a flight but now and again I had a few problems trying to get it functioning. Luckily Jeff from FSFS gave instant help on every issue, support from FSFS is great so there is no need to worry about problems. Installing it was very simple, just a simple installer that guides you on what to do, most of it is automatic and only basic computer knowledge is needed to be able to open the installer file! (just click it!) The only edit I had to make was moving its installation directory from my Desktop to C:, FSFS Support guided me through though and that was only as I had the small issue. The main aim of FSFS is to help you improve your aircraft handling skills and make you a more skilled and therefore better pilot. After using FSFS for a while you will see a difference in your flying as you will start to predict the errors alongside your instructor, therefore with FSFS turned off you will be better skilled and in less need of an instructor! You can also take an airmanship test once you feel you have bettered your aircraft handling skills. After a few weeks of using FSFS I felt as though I was ready to take the airmanship test, and the test is great fun! What I love about FSFS is how its built perfectly to suit every flight simmer, for example if you are a veteran or starting out is doesn't matter. Landing anywhere on the runway is suitable and FSFS wont get confused! So don’t worry about landing on a fixed point of the runway as if land with a few feet of the runway left and bounce a lot! FSFS and your instructor will just give you pointers on how to improve next time! FSFS also monitors a wide array of your aircraft, your instructor won’t just comment on how well you fly but also (optional) your usage of aircraft lights and the engine! FSFS will also monitor your radios and NAV, this is great as its just what a real instructor would do. An example of a NAV command is ‘NAV one is tuned to “” FSFS would then read out what your NAV is tuned to, a great little feature! Another feature which is also interesting is how your instructor will ask you questions during flight, for example a question I was asked on one of my flights with FSFS was ‘How much fuel will we have when we reach our destination?’ even the smallest of details add to the added realism FSFS brings to X-Plane. FS Flying School is really a virtual ‘Flying School’ as it is packed full of so many features to explore! You may have picked up already from this review how real I think your instructor is! All voices are natural human voices and not computer generated. Having hundreds of pre-recorded phrases is really realistic. I also noticed how the instructors also show human emotion, for example if you bank hard to the left your instructor will react as though he/ she is in the plane feeling the G-Force! For example your instructor would say ‘Whoah, watch that bank angle, its starting to get a bit too steep!’. To add to the realism you can also choose between three different flying instructors, each will say the same lines although gender and accent varies between instructors. To further add to the realism extension packs are available as an additional purchase, extension packs include the C208 Grand caravan, C172 and Voice Command. Each pack is tailored specifically to the aircraft, this means that new commands are added and your instructor will guide you on specific aircraft instructions. I have to admit that the Cessna 208 is one of my favourite aircraft and its great that there is an extension pack available! The voice command pack will give you the ability to talk back to your instructor which knocks down the barrier between you, the screen and the instructor! Its absolutely fantastic, I will get to that in further depth later though. FSFS is a highly complex programme and with that it is also very configurable. There aren’t any options that I wish could be added, everything you need is there. The programme consists of a few tab like pages for which your can configure all options. Before I get into each and every option and page of the programme there is some ‘out of programme’ configurability that can also be done, if you fly an aircraft often and it is not supported by FSFS by default then there is a way to make it supported. The process is very simple and there are also instructions in the manual that comes with the programme. Go to where you have installed FSFS, and then open the ‘aircraft’ folder. The last step is to open the new file in Notepad to configure the settings. Thats it! There are a few more things to configure not just the first flap degree! However apart from the few extra settings FSFS will now support the aircraft! For a more detailed explanation you can see the manual that is provided with FSFS and is very detailed. If you are of the very competitive nature your flight scores in custom supported aircraft will not be added to the online FSFS scoreboard though. So back to programme options, overall there are 7 pages each with useful information and configurable options. Inside of this page are 4 tabs which will tell you how to start FSFS and a specific situation, for example an ILS approach. These tabs are very useful and I think could look a little better but the tabs function as you would expect. On this page you can select your Pilot Instructor and configure settings about you, consisting of your Pilot profile and your name. Over on the instructor side you have the ability to choose an Instructor, there are a total of 3. Mr Smith, Mr Mitchell, and Miss Aviatrix! Very thoughtful names! Mr Smith is the standard instructor voice and in my opinion is the most realistic to real life! Mr Mitchell’s voice is very unique and great for a comedy flight! Other options include ‘Background Chatter, Background Humour, Display Captions and Monitor Lights Usage. I tend to leave off background humour as for a serious flight its not needed, although if you want to lighten the mood in the cockpit you can enable the humour! The humour is from passengers and not your instructor, If you want to know what is said by passengers as humour I will let you get FSFS and find out! Another option on this page is Automatic Detection, this is very useful option whilst flying. Automatic Detection will detect when you enter cruise and landing mode, if this is disabled you have to use keyboard commands to advance or take back the flight mode. This is the ‘Flight Plan’ page, now unfortunately you can’t upload a full flight plan for an external source, although that would be a great option, especially if the instructor could understand the plan and assist you when flying even further! Instead you have the option to enter Transition Altitude and different speeds, still very useful and it also helps FSFS determine commands based on these options. This is the aircraft page by which you select different options. You can choose for the instructor to also monitor different lights and engines here, obviously the more you tick here, the more you will hear from your instructor! Below that is the instructor volume, I always set this to Loud as it therefore sounds slightly muffled through the headphones (or computer speakers) which is very realistic to real life when flying. The Log Book page will provide you with all of your logged information. All flights will show here and interestingly there is also the option of ‘Career Analyzer’ and ‘Pilot Briefing’. The Briefing option is very good, it will notify you of previous errors and tell you how to correct them in the next flight. After that there is the setting page which allows you to edit even more settings! and configure FSFS to tailor to you and your needs. The voice command pack is an optional extra, and in my opinion is most certainly worth the extra pennies! It’s great to be able to speak back to your instructor and say for example ‘Ready for Takeoff’ by which your instructor will reply with ‘Ok, we are about to take off, visibility is…’ absolutely fantastic! it really helps distinguish the barrier between you, the instructor and the screen! Rather than being an extra programme the voice command options are within FSFS, after you simple enter your serial code the pack will be registered. The sensitivity of how well commands are received depends on how clear you talk and how good your mic is. That said you really don't need an expensive microphone, I used a PC headset with headphones and a mic which worked just fine. Wearing a headset and talking also adds to the great realism added by FSFS! If you are worried that FSFS wont be able to pick up your voice clearly you can test it within Microsoft. This is because FSFS uses Microsofts built in speech recognition system. You can also demo the voice pack for free, this is great and gives you a really good chance to see if it will work for you. You can also assign a button to press when talking to the instructor or you can have him/ her listen all of the time. If you are in a noisy environment I wouldn’t recommend having it set to ‘Listen’ as it may pick up commands you haven't said. Pushing a button to talk isn’t that much of a hassle though after comparing both methods. Is FSFS still an ‘active developing’ programme for X-Plane, or are you focusing on new products instead? It certainly is a product in continuous development. We've developed a huge amount of technology for the FSX version which is not yet in the X-Plane version and we are working on getting what we can into the X-Plane version. What features do you intend to add to FSFS for X-Plane in the future? We're adding built-in support for even more popular X-Plane aircraft. At present the core product supports 15 popular planes, but we want to get that up to around 25 at least. We also want to add a screen at which pilots can add the data for extra aircraft as you mentioned in the review. There are also a great many more Voice Command features in the FSX product we'd like to see added to our X-Plane version, such as "Airport 2 o'clock?" which will identify the airport in the distance in that direction and also "Nearest airport?" which is, I think, self-explanatory. Do you intend to introduce a Mac version of FSFS for X-Plane? We ran a KickStarter fund raising project for this and sadly it did not achieve its goal. We have no plans at present to develop a Mac version. We do however publish FS Instant Approach PRO for XP10 for the Mac. I understand that FS Inventions develop an FSX version of FSFS as well, did you face any issues when starting to develop for X-Plane? 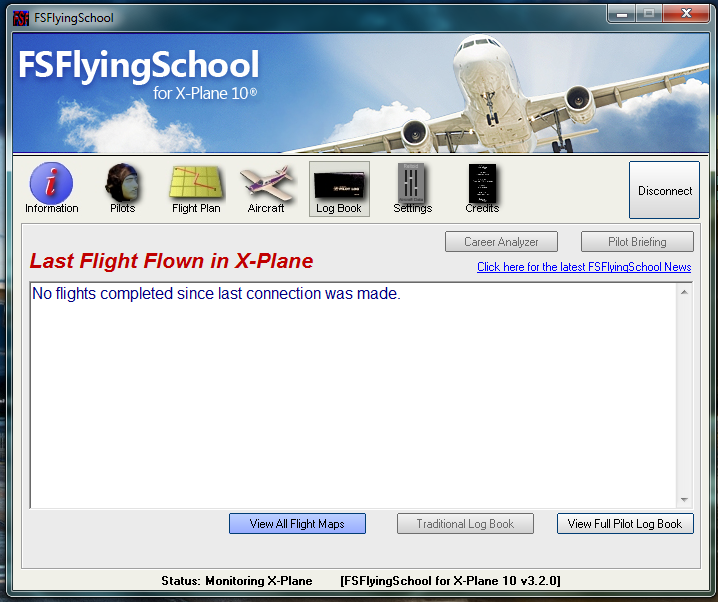 All core communications between FSFlyingSchool and FSX are handled by FSUIPC and so we needed the same for X-Plane. 'XPUIPC' by Torsten has done a splendid job for us. Beyond that, there are lots of differences of course. I especially like the replays of landings it is possible to examine in great deal (and slow motion) with X-Plane. They've been most useful with product development. Will you be creating any more detail packs, for example a detail pack for the Carenado B200 King Air would be great!? That certainly is a splendid aircraft! As for more detail packs - this again is something we've done a huge amount of work on (14 detail packs) for the FSX version of FSFlyingSchool and we'd certainly like to offer some of that as X-Plane detail packs too. We've not yet done a detail pack for the Carenado B200 King Air - but it sure is tempting! 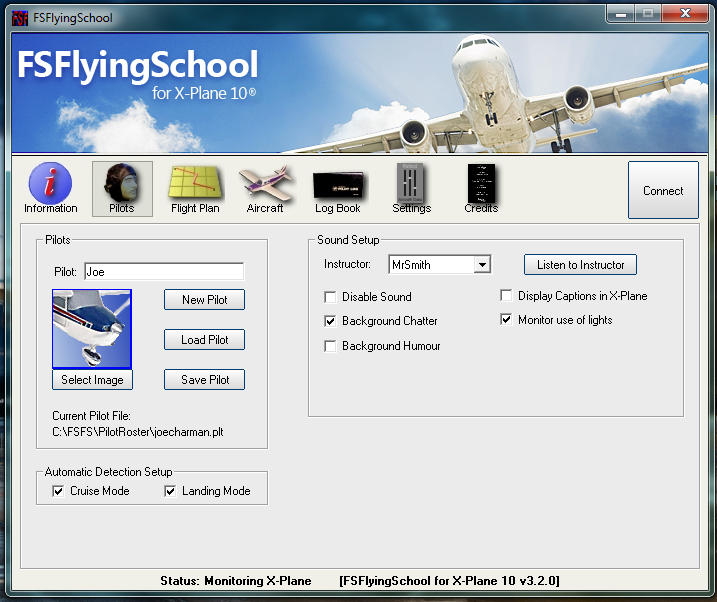 This is more than a simple X-Plane Plugin, its a desktop application with lots of configurability. With the conjunction of the voice commands pack and optional detail packs for the C208 and C172 FSFS provides the complete solution for a flight school in X-Plane! Flying in X-Plane is great, with the addition of the voice command pack I felt as though I was actually talking to someone who was sat next to me in the aircraft, a similar feeling to using PilotEdge. I did have a little trouble when setting it up and that did set my initial impressions of the programme, however after using it everything pieces together and overall I am very impressed by the application. I was impressed also of how much little space each programme takes! Even when fully installed it didn’t affect my memory and I hardly notice I have the programmes installed. Manually creating/ duplicating files to add support for aircraft that are not supported can be a tricky process if you are not good at following instructions or computer wise! It’s possible though and the manual is detailed with everything you will ever need within it. Maybe there could be a page within FSFS to add custom aircraft support, a page where you can simply enter the variables (discussed above) and the programme will write the files? Luckily for me I can use FSFS as I fly X-Plane on a windows run computer, if you use Mac currently I’m afraid FSFS doesn't have a Mac version. Therefore If you run a windows computer and are interested in the fact of feeling as though you are in X-Plane with a virtual instructor who you can talk to, FS Flying School is phenomenal and perfect for you! FSFS is a programme that you have to use yourself to really appreciate how great it is and how much realism it brings to X-Plane especially with the Voice Command pack! So, Should you buy it and test it for yourself? Yes! You will be impressed, especially when you start talking to your instructor! The videos on YouTube don’t capture what it’s like to actually say commands and have someone respond! Therefore I recommend a purchase of both the base FSFS and the voice command pack, detail packs can always be added when needed. Option french language is possible? Sorry I don't believe FSFS supports multiple languages. English only at this time. This could be something to suggest to the developers though.